Cantonese is an Asian language which comes from Canton, southern China. Often, people use the word 'Cantonese' to refer to the Guangzhou dialect, Hong Kong dialect, Xiguan dialect, Wuzhou dialect, and Tanka dialect of Yue. 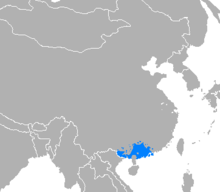 However, linguists prefer to keep the name 'Cantonese' for the Yue dialect of Guangzhou (Canton) and Hong Kong. Using this classification, Cantonese is the prestige dialect of Yue. Cantonese is spoken by people in Southern China, Hong Kong, Macau, Malaysia and Singapore, as well as places with many overseas Chinese who came from Cantonese-speaking parts of China, such as Melbourne. It is also the most common language of overseas Chinese in Southeast Asia and North America. It is said that over 100,000,000 people speak Cantonese. It is a tonal language with 6 kinds of tones. While Cantonese is only the third most spoken dialect of Chinese, only behind Mandarin and Wu, its official status in Hong Kong and Macau make it widely known among other Chinese dialects. Even though Cantonese is called a dialect of Chinese, Cantonese is so different from Mandarin, the most spoken dialect of Chinese, that they are mutually unintelligible, meaning that speakers of one language cannot understand the other language without learning it beforehand. It is said that Cantonese is more closely related to Classical Chinese than Mandarin. Cantonese is from the Sino-Tibetan family of languages. In Macau, the majority speak Cantonese and it is also the official language with the other being Portuguese. But here the people speak lots of other languages as it is popular with tourists because of its casinos. ↑ "Cantonese almost became the official language".